I’m Robin Rozhon, an SEO Strategist focused on technical SEO and web analytics. I first became interested in the World Wide Web at the high school during HTML classes. At the University, classes were more focused on programming languages such as Java, C++, and SQL. Even though I’ve obtained a Master of Science Degree in System Engineering and Computer Science at the Technical University of Ostrava, I never felt like an engineer and kept focusing on web development and web design. After my first year at the university, my friend and I started building websites for our first clients (Skrč to studio). I was eager to advance my coding skills so I spent nights in light of computer screens building even more pages and features than we initially discussed. I quickly realized that having a great looking website with cool functionalities is not the end. Every website needs users to become a great asset to every business (capturing leads, generating revenue, etc.). My focus shifted from web development and web design towards SEO, web analytics, and the complexity of digital marketing. After a couple years, I decided to give up a part of my income and get a grasp of how high-end professionals work with the biggest brands so I applied for an internship at RobertNemec.com. It’s been a great experience and sharpened my skills. Robin had come to the agency already armed with a lot of know-how needed in digital marketing field like HTML and SEO skills. His outputs were often comparable to those of our more experienced consultants and delivered results on time. We are very happy to continue working with Robin after the end of the originally agreed period. At that time, there was an opportunity to work for Web Consulting, so I accepted the offer for only 6 months because I’d already decided to move to Vancouver (Canada) where I started working at GuaranteedSEO as the SEO Specialist in November 2014. After two years, I got an opportunity for work at one of the best and most iconic Canadians brands – MEC. 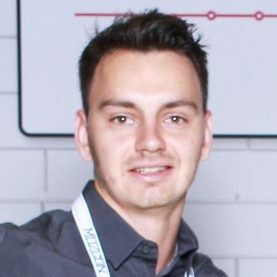 I accepted the offer and started working as an in-house SEO in 2016. I relished my time at MEC. We have accomplished great results. I got a chance to create and drive the SEO strategy, and as a part of the Branding team, to be involved not only in SEO but also in branding challenges. In March 2018, I accepted a calling from the brand that embodies two of my biggest passions – sports and technology – and started working at Electronic Arts (EA) to pursue the ambitious vision we have. I enjoy what I do so when I’m not working, I talk about SEO and share my experience.